Mix in a pitcher tequila, lime juice, sugar, and Triple Sec until sugar dissolves. Using a blender or a food processor, blend together strawberries and ¼ cup of tequila mixture until smooth. Add blended strawberries to pitcher and stir. Keep chilled till ready to serve. Pour salt on a small plate, rub glass rims with lime wedges, and dip glass rims into salt to coat. 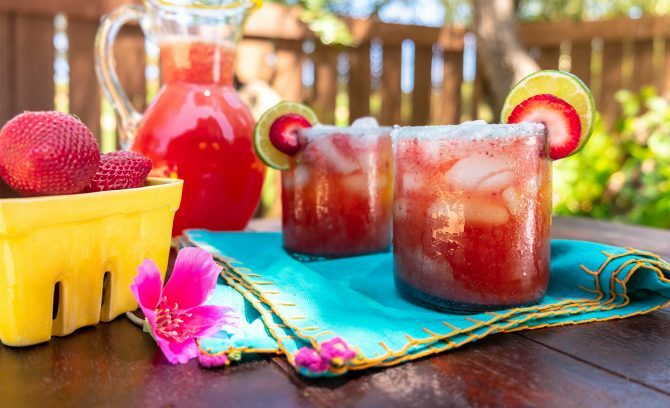 Add ice to glasses, pour margaritas, and garnish with lime wedges and strawberries. Cheers!